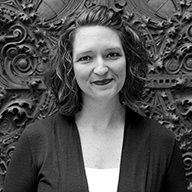 Dr. Traci Rose Rider is the Coordinator for the Design Initiative for Sustainability and Health, Research Associate, and Research Assistant Professor in Architecture at North Carolina State University’s College of Design. Dr. Rider’s research has focused on the relationship between the design culture and the notion of sustainability, exploring factors impacting environmental attitudes of designers including environmental education, learned associations and informal influences. Dr. Rider’s professional experience over the past ten years has included work in international design firms, green building non-profits, university extension, and sustainability consulting. Dr. Rider has presented and been published in the proceedings of conferences such as Architectural Research Centers Consortium (ARCC), the National Outreach Scholarship Conference (NOSC), and the Smart and Sustainable Campuses Conference (SSCC). She has also been featured in Dwell magazine, was granted the prestigious individual U.S. Green Building Council (USGBC) Leadership Award in Education for 2005, and was included in a group labeled as “The Re-Inventors” in Vanity Fair’s Green Issue in May 2006, in the company of established visionaries in sustainability such as William McDonough, Paul Hawken and Sim van der Ryn. She has authored Understanding Green Building Guidelines for Students and Young Professionals (W.W. Norton, 2009), and has co-authored Understanding Green Building Materials (W.W. Norton, April 2011). Dr. Rider’s funded research projects include methods for introducing building science and health topics to middle school students in North Carolina through STEM exercises in partnership with the NCSU College of Education, as well as supporting the development of interdisciplinary consortium for NC State in the areas of Sustainable Cities. She is also currently pursuing opportunities for cross-disciplinary explorations of urban places for aging, in partnership with peers from both the NCSU Psychology Department and the Family and Life Sciences department. Through her teaching, she examines methods for engaging other fields such as civil engineerin the development of interdisciplinary consortium for NC State in the areas of Sustainable Cities. She is also currently pursuing opportunities for cross-disciplinary explorations of urban places for aging, in partnership with peers from both the NCSU Psychology Department and the Family and Life Sciences department. Through her teaching, she examines methods for engaging other fields such as civil engineering and environmental sciences in design education. She also currently teaches the two core courses for the PhD in Design Program at NCSU, Research Paradigms and Research Methods. Under the umbrella of Extension at a land grant university, Dr. Rider works with North Carolina communities that have a community development need, using participatory action research and student involvement to help facilitate the development of concept designs to help strengthen North Carolina’s communities in terms of economy, human health, and the environment.